Perfect support for a spotting scope, binocular, camera, or small telescope. 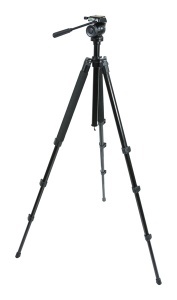 Sturdy aluminium tripod adjusts in height from 18.9 inches to 70.5 inches and includes a two-way fluid pan head with quick release plate. The four-section legs can be set to three different angles and use quick & easy flip lever locks for length adjustment. The centre column can be extended when additional height is needed. A retractable hook lets you add weight if extra stability is required. Comes with a tripod case and shoulder strap. The perfect tripod should be stable yet lightweight and easy to operate, requiring minimal knob twisting and lever flipping. The Celestron TrailSeeker was designed to be your perfect tripod. It is lightweight (1.79kg) and compact, yet it can hold up to 4kg of equipment. The aluminium legs of the TrailSeeker Tripod are fully adjustable, not just in length, but in their angle as well. With the centre column fully extended, the maximum height achieved is 70.5 inches (58 inches with the column down). Each leg is made up of four sections that can be shortened or lengthened with the flip of a simple lever lock. This makes it easy to make the tripod a little taller or a little shorter as your terrain or needs change. The centre column of the TrailSeeker tripod does more than just go up and down. The bottom end of the column holds a retractable balance hook. This simple device can make all the difference in the stability of your tripod, especially on windy days. Just hang something heavy from the hook like a backpack and you’ll be amazed at the difference. When the hook is not needed, it retracts up into the centre column to stay neatly out of the way.